USS Arizona (BB-39) burning after being hit by an air-dropped Type 99 Number 80 Mark 5 1,760 pound (800 kilogram) modified 16-inch (406 mm) naval shell from a Nakajima B5N2 Type 97 carrier attack bomber that penetrated near Arizona's Number Two turret and caused the forward ammunition magazine to explode. 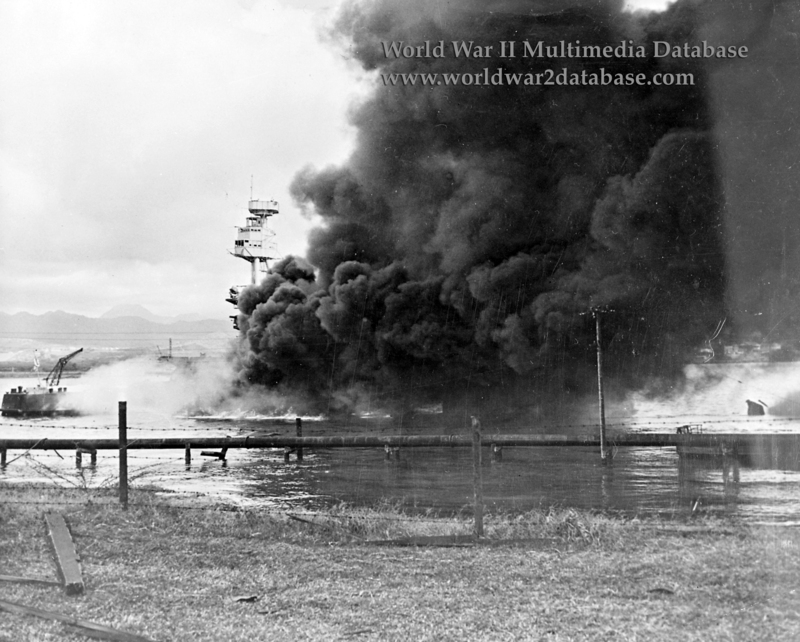 Arizona, along with other stricken battleships, began leaking oil that ignited on the water. Arizona had moored at berth F-7 on December 5 and received 1.5 million gallons (5.7 million liters) of “Bunker-C” oil for a trip to the United States by Christmas. After the bomb hit, some of the oil burned off in a fire that lasted for 60 hours. Major (later General) Alan Shapley (February 9, 1903 - May 13, 1973) was commander of Arizona's Marine Detatchment and his battle station was on the mainmast visible in this view. Avoiding the fires, Shapley helped evacuate sailors from the stern. He later recalled, "I apparently got knocked off or blown off. I was pretty close to shore... There was a dredging pipeline that ran between the ship and Ford Island. And I guess that I was only about 25 yards from the pipeline and 10 yards from Ford Island, and managed to get ashore. I wasn't so much covered with oil. I didn't have any clothes on. [The burning fuel oil] burnt all my clothes off. I walked up to the airfield which wasn't very bright of me, because this was still being attacked at first. I wanted to get a machine gun in the administration building but I couldn't do that. Then I was given a boat cloak from one of my men. It was quite a sight to see 400 or 500 men walking around all burnt, just like charred steak. you could just see their eyes and their mouths. It was terrible. Later I was sent over to the island and went to the Marine barracks and got some clothes." Many men attempting to flee the burning wreck drowned yards from Ford Island; survivors recall their screams for help as they succumbed to burns and exhaustion. Others used the pipeline in this view as shelter from strafing Japanese planes. Probably taken on December 8. Date Estimated.